The latest Samsung flagship has a 3,220mAh battery that’s a mere 20mAh larger than the one inside its predecessor so we didn’t really expect the Galaxy Note 4 to blow it out of the water. But we were in for a surprise – what was already an excellent 75 hours of endurance turned to be a superb 87 hours on the latest phablet by Samsung. Right from the get-go let us say that the Galaxy Note 4 placed right on the edge of the top 10 – at tied number 8 which is an incredible result. And it didn’t even need to enter either of its power saving modes. Let’s break things down – talk time on the Samsung Galaxy Note 4 tied the second best score for a smartphone – an immense 28:34 hours to match the Nokia Lumia 1520. The talk time was a whopping 10 hours more than the 18 hour run of the Samsung Galaxy Note 3 and some 5 hours more than the Apple iPhone 6 Plus. The next score was also impressive although not quite as much as the first. 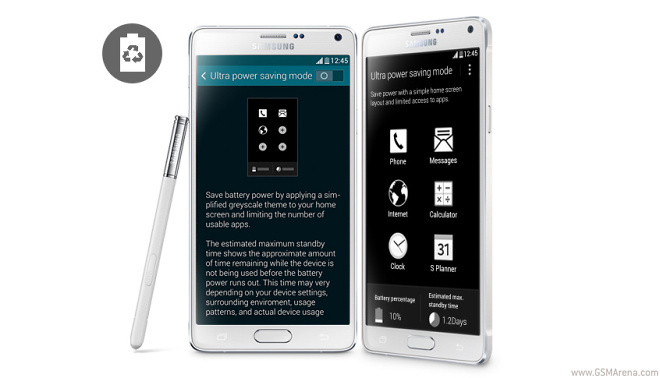 The Samsung Galaxy Note 4 was able to do close to 11 hours of constant web browsing. That’s an hour and a half more than its predecessor and the Apple iPhone 6 Plus but far from the best in regard. Still it’s a very good result considering the Galaxy Note 4 packs a big, bright Super AMOLED that has a higher resolution than most of the phones in our database. As a comparison the 5.5″ QHD LG G3 managed a meager 6:40 hours of browsing. The next test was video playback. The Samsung Galaxy Note 4 is a great on-the-go video consumption device thanks to its speedy Snapdragon 805 chipset, its ability to run almost anything up to 4K resolution and, naturally, its best in-class display. The score it achieved in our video test was equally impressive as the Galaxy Note 4′s spec list – a 17 hour and 25 minute run that’s the second longest in our testing on smartphones. The Apple iPhone 6 Plus went on for 11 hours and 15 minutes while the Galaxy Note 3 13 and a half hours. 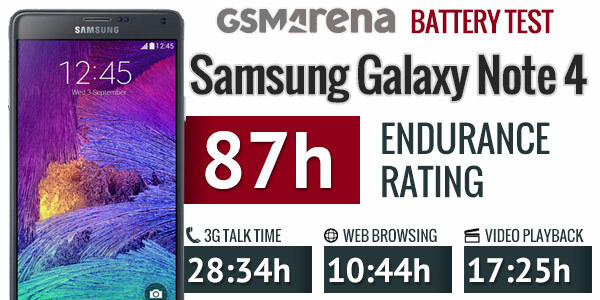 When we combine all the scores with a very good stand-by we saw from the Note 4 we get the 87 hour endurance rating. It represents the number of hours you can go on a charge if you do an hour of calling, browsing or video-watching a day. Heavier users will naturally get less power autonomy – you can add your own usage pattern and compare the Samsung Galaxy Note 4 to any of the devices we’ve tested you can do so on our Battery Life page.